A country that saves 45 percent of its GDP faces structural pressures that push it toward surpluses not deficits in the absence of extraordinary domestic stimulus, and freeing China’s financial account now would likely push China back toward surplus as relaxed controls on outflows would result in a weaker currency. Moving more rapidly to liberalize the financial account and open China to cross-border flows without fixing the underlying structural problems in China’s financial system—including extensive implicit guarantees of both borrowers and “shadow” intermediaries, and intermediaries that lack the capital to absorb the “true” losses on the lending that they have already done—risks generating a new source of instability, both internally and externally. We have some experience here: China’s poorly sequenced 2013-14 financial account liberalization led to an unhealthy carry trade and a rapid rise in China's short-term external debt—and thus helped to create the tinder that made China’s 2015 exchange rate “reform” (I would call it a controlled depreciation as much as a reform) so dangerous. Conditions now differ—the incentives for the carry trade have largely gone away as Chinese and U.S. rates have converged—but it is still safer for the world and safer for China if China’s financial system remains mostly cordoned off from the world rather than fully integrated into it. China, in my view, should focus its energy on moving faster on internal reform rather than moving faster on external financial account liberalization. Is China Heading Toward "Structural" Current Account Deficits? 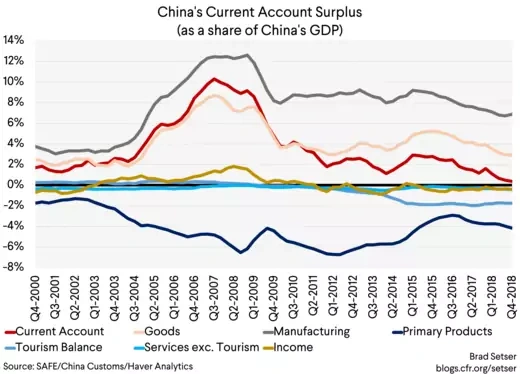 As the Economist (and many others) have noted, China’s current account surplus has come down—both as a share of its GDP and relative to the GDP of its trading partners. The extent of the fall reflects a 2014 change in the way China measures its tourism imports, which raised "services" imports by about a percentage point of GDP. * Yet this change only accounts for a small portion of the fall in China's surplus: the majority of the fall is real. Because much of the fall has come from an increase in China’s commodity imports, the extent of the fall also is a function of the oil price. When oil was falling, I believed predictions of a 2019 current account deficit were clearly premature. I am a bit less sure now that oil is back at $70 a barrel (roughly its 2018 average), particularly with the recent rise in iron ore prices. But the fall in the surplus last year was not just oil. It was a function of many thing: still strong imports in the first part of the year thanks to the 2016 and 2017 stimulus, and rising semiconductor prices. Import growth now is much weaker, and semiconductor prices are falling. The Q4 trade and current account surpluses were both actually fairly large (the Q4 current account surplus was $55 billion) and China easily defied predictions that it would run a deficit in 2018. But there is little doubt that China’s surplus is now much more modest than it was prior to the global crisis. The question is whether this fall is “structural” or a function of policy. I think the answer is clear. According to the IMF, China still saves around 45 percent of its GDP. That’s the same level of national savings as Singapore. Singapore runs a 20 percent of GDP current account surplus. My guess is that without a 10 percent of GDP (or more) “augmented” fiscal deficit, China would also run a substantial surplus. I have long argued that China’s headline central government fiscal deficit is too small—and that China and the world would be substantially better off if China abandoned its strange commitment to keeping the reported central government fiscal deficit under the “Maastricht” three percent of GDP level. That would allow more on budget borrowing at a low cost, and make it safe to cut back on some of the off balance sheet borrowing. Remember that during China's last tightening cycle, back in 2014 and 2015, the current account surplus was heading up in a big way. It only stayed under 3 percent of GDP (in my view) because China changed how it measures tourism imports. The turn back toward stimulus in 2016 is the main reason, together with the partial recovery in the price of oil, why the surplus has come down in the past couple of years—not any structural change in China’s savings. It is true that China has already “aged” so to speak, and now in theory should be saving less as its already old population draws on their accumulated assets. It isn’t clear though how well the life-cycle models of dissavings work in practice—I think most models predicted that Japan would be running a current account deficit by now. No matter though, according to the IMF (see page 21), aging should reduce China’s savings rate by 6 percentage points by 2030. That though would leave China with a national savings rate of around 40 percent. That’s the kind of national savings rate that typically leads to large external surpluses. Assuming that the fall in savings leads to a current account deficit requires assuming that China, with an aging population, can sustain its current level of investment even if it cuts back—as the IMF and the rating agencies and others believe necessary—its augmented fiscal deficit. I would happily take the other side of that trade. And from a global point of view, the risks here are asymmetric. Contrary to much of the recent angst, a Chinese current account deficit is good for the world—the advanced economies have plenty of savings relative to the private sector’s desire to invest and real interest rates are low (see Summers and Rachel). A Chinese current account surplus by contrast adds to the global savings glut and puts further downward pressure on real interest rates. With the de facto limit on how low interest rates in other economies can go, a shift back to a large surplus in China risks generating contagious secular stagnation. This debate though is largely academic, China has shown no sign of adopting the kind of policies needed to bring down its savings rate, and recently reversed its fiscal tightening. Should China Accelerate the Pace of its Financial Account Liberalization? The Economist also argues that freeing China’s financial system will lead to a more efficient allocation of capital inside China. Perhaps. It isn’t actually clear that financial sector liberalization in the presence of pervasive implicit guarantees always produces the best outcomes, particularly when there are under-capitalized financial institutions that have an incentive to gamble for redemption. What seems more likely is that a more open financial account would lead to a more rapid reallocation of Chinese savings out of China—e.g. more capital flight. And that would undermine the current, fragile, equilibrium in China’s financial account that has kept pressure for further yuan depreciation modest. Ever since the (controlled) depreciation of the yuan came to an end two years ago, China has been able to keep the yuan stable recently, and to do so without much intervention. Right now, China has fairly tight controls on how much money Chinese residents can take out of China. Those controls aren’t prefect—errors and omissions (the “hottest” form of flight capital) are still significant, and the tourism accounts include some disguised outflows. 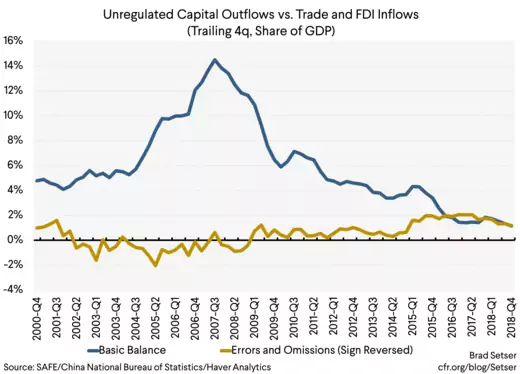 But they have cut down on capital flight (notably the large FDI outflows from the insurers, which were a significant drain on reserves before the controls were tightened) and thus reduced pressure on China’s reserves. Even in last year's yuan depreciation China still on net added to its reserves in 2018, and my broader measure of official asset growth stayed positive. Conversely, China has selectively—and in a very controlled way—opened itself up to portfolio inflows into its bond market and equity markets. Central bank reserve managers can in theory buy and sell yuan freely, and China has pushed for inclusion in the key bond and equity indexes. Those efforts have generated portfolio debt inflows of something like $100-150 billion (roughly 1 percent of GDP) a year. And since China is (still) in current account surplus, those inflows have allowed China to fund the Belt and Road (Chinese outward lending is growing, and that’s a flow through the state banks—e.g. a policy flow) without drawing on reserves. Technically, the current account surplus and net FDI inflows are about equal to the current pace of “hot” outflows—making it possible, in some sense, for China to borrow from the world to finance its lending to the world. But that equilibrium is fragile, and hinges on a combination of controls (on outflows) and China’s commitment to resist further yuan depreciation. 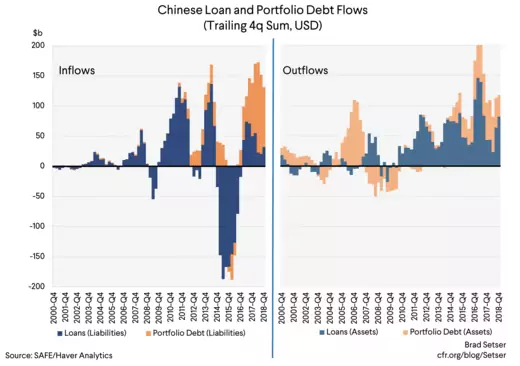 Outflows in the short-run tend to generate more outflows, as Chinese exporters start to expect further depreciation and hold onto the dollars they earn on their exports. 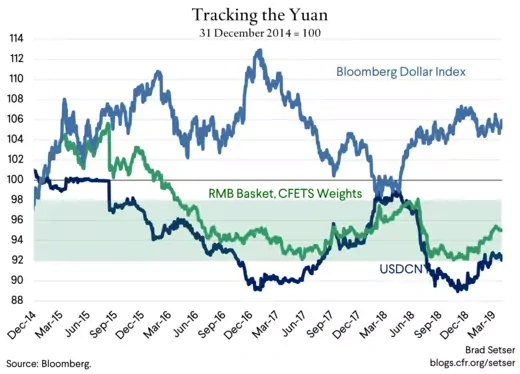 Conversely, stability often begets stability, as the advantages of diversifying into yuan become more apparent to outside investors and exporters have less of an incentive to hold onto dollars. My guess is that the portfolio inflows that China has attracted recently would fall off in the short-run if China let its exchange rate go—why buy now, when you can buy at a more attractive price later? 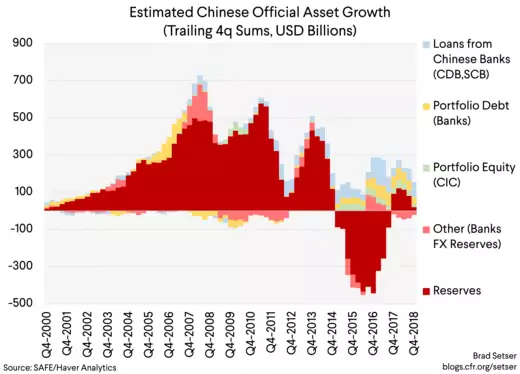 Bottom line: if a liberalized financial account results in more outflows than inflows (as seems likely given that controls on outflows are now tighter than controls on inflows), China’s currency would depreciate and that would push China’s current account back into a substantial surplus. That’s why I think it makes sense for the United States not to be pushing for China to free its financial account and to free its currency right now. There is a—fair—argument that this is a position that the U.S. shouldn’t take because it runs against the United States long-standing demand for China to let its currency float and make a market determined exchange rate. Yu Yongding, among others, has made this argument. As has Mark Sobel. I consequently don’t think it is much of a shift for the United States to refrain from calling for China to float now when the odds are that a shift to float would hurt not help the United States. The call for a market determined exchange rate used to be a coded call for a stronger yuan as much as a call for a free float. Call it embedded liberalism rather than free market fundamentalism if you want. And more narrowly a new bout of yuan depreciation would put the coming trade truce at risk. 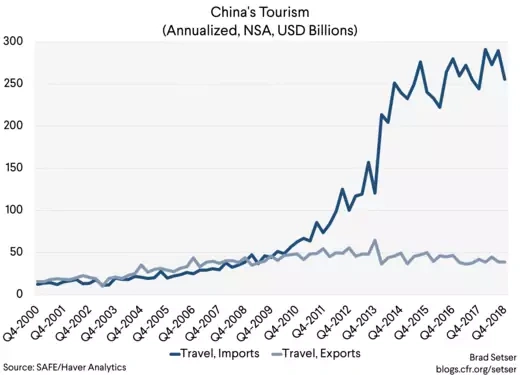 * A chart of China's tourism imports shows the dramatic impact of the change in measurement, tourism imports jumped by around $100 billion in 2014. ** Barry Eichengreen notes that there is a high probability that China's level of investment is overstated, which implies either that the current account surplus is a bit bigger than reported or that the true level of savings is a bit lower. 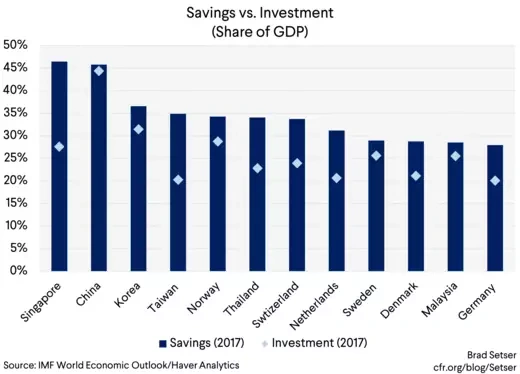 No matter, even if it is a bit less than 45 percent of GDP, China's high level of savings makes it an outlier among the major economies.